This cat figure by Rinconada is a work of art. Handcrafted and hand painted, it is signed by the designer. Certificate of authenticity attached. The figure is 10" high x 6" wide. 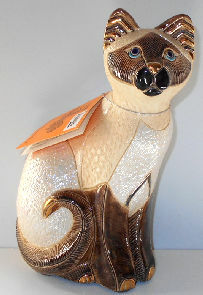 It is labelled Large Siamese Cat #435, produced in 2002. Previously owned but in new condition. Note: This figure weighs almost 3 pounds.